As it cools down in Minneapolis, SEO is top of mind. As the seasons change, so does the search volume for your products and services. Staying in tune with these trends will keep your website’s SEO cranking on all cylinders year-round. Inevitably, seasonality will dictate the traffic volume to your website. Doing proper keyword research to understand the highs and lows of the search market will help you attract more traffic during both the busy and slow months of the year. Most keyword tools show a twelve-month average search volume. 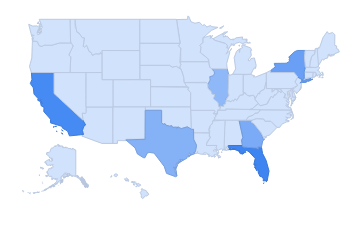 Our favorite tool for watching the ebbs and flows of search is Google Trends. With Trends, you can research emerging keywords depending on your timeframe and location. As we’ve previously discussed, Trends can be useful in finding the right keywords for SEO. Let’s take a look at a few ways that Google Trends can keep you ahead of the curve. 1. Trending up or down? When deciding between similar keyword terms, its best to go with the one that appears to be on the upswing. Search preferences changes as people become more familiar with your products or services. Keyword density plays a huge role in proper SEO. Looking, for example, at the graph below, people used to search “search engine optimization” far more often. Eventually the shorthand “SEO” entered the vernacular and you can see the result. 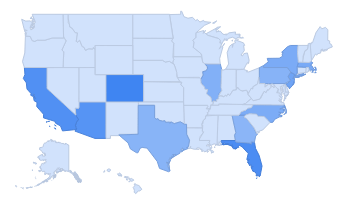 However, if you’re targeting business in Colorado or Arizona, you may want to consider using the term “SEO marketing” instead. 3. What are people searching for next? Google Trends provides you a list of rising terms. These are search queries that have gained ground during the time period you’ve specified. If you’re a provider of SEO services, you’re next move may be to optimize content for local SEO services. If, to the right of the keyword, you see the word “breakout,” this means that the term has grown in popularity by more than 5000%! The way people search changes quickly. Position yourself to stay ahead of the curve by watching the trends. That’s what we’ll be doing up here in Minneapolis!